The Wilson Profile XLS package set is a women's right handed complete 15-piece set that includes a driver, fairway wood, hybrid, 6-9 irons, pitching wedge, sand wedge, putter, stand bag, and matching head covers. It is designed for ladies who play the course regularly or beginners looking to take their swing at the game. These clubs have a unique powerful design that focuses all specs to deliver distance through faster swing speeds and control. Protect your clubs on and off the course with the 7-way cart bag and matching head covers. The bag is lightweight, features lumbar support and it easily straps to any cart. Let the Wilson Profile XLS golf club set help you lower your handicap with its low center of gravity and wider club heads for greater accuracy on all your shots. 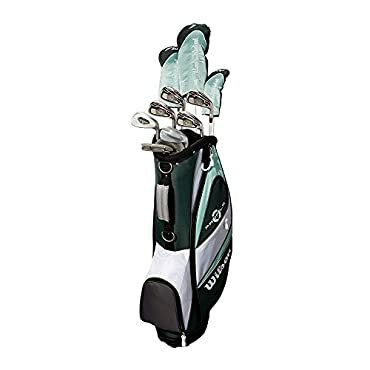 Wilson Profile XLS Women's RH Flex Graphite Golf Club Package Set w / Bag & Balls -- Free 1-3 Day Delivery With Hassle-free, 30-day Returns! Last updated: April 20, 2019 at 11:35 EST. Pricing information is provided by the listed merchants. GoSale.com is not responsible for the accuracy of pricing information, product information or the images provided. Product prices and availability is subject to change. Any price and availability information displayed on amazon.com or other merchants at the time of purchase will apply to the purchase of the product. As always, be sure to visit the merchant's site to review and verify product information, price, and shipping costs. GoSale.com is not responsible for the content and opinions contained in customer submitted reviews.